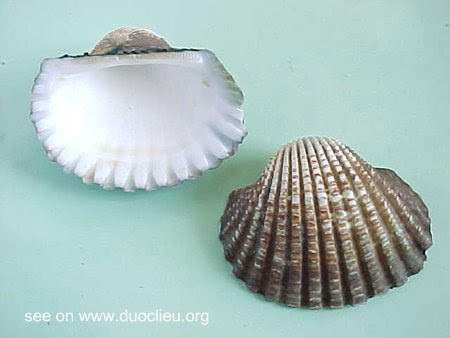 Ark shell (Walengzi)- Arca granosa L.
Zoological Name: 1. Arca granosa L.; 2. Arca subcrenata Lischke; 3. Arca inflata Reeve. Part Used & Method for Pharmaceutical Preparations: The shells are collected from the sea when the tide is out. After the flesh is removed, the shell is dried and ground into powder. Meridians: Lung, stomach and liver. 1. Scrofula and goiter: Ark shell (Walengzi) is used with Seaweed (Haizao) and Laminaria (Kunbu). 2. Stomach pain and acid regurgitation: Ark shell (Walengzi) is used with Cuttlefish bone (Wuzeigu). 3. Subcutaneous nodules: Ark shell (Walengzi) is used with Burreed tuber (Sanleng), Zedoary (Ezhu) and Turtle shell (Biejia).